On the Flat Earth, How High is the Sun? On this page, the height of the sun in various Flat Earth models are examined. We shall see that there are many techniques, with many answers. Sometimes, the exact same techniques have been used to find a multiplicity of results. About the best one can say is that the sun's height is between zero and 4,000 miles in most Flat Earth models. Wilbur Glenn Voliva (1870-1942) was the first radio evangelist, and a major proponent of the Flat Earth, offering $5000 for anyone who could disprove his flat earth theory. Ths image is from the article "$5,000 for Proving the Earth is a Globe" (Modern Mechanics - Oct, 1931), which is available online at the Flat Earth Society. This graphic shows that, on the Equinox, an observer at 45 degrees north latitude would see the Sun at an elevation angle of 45 degrees. 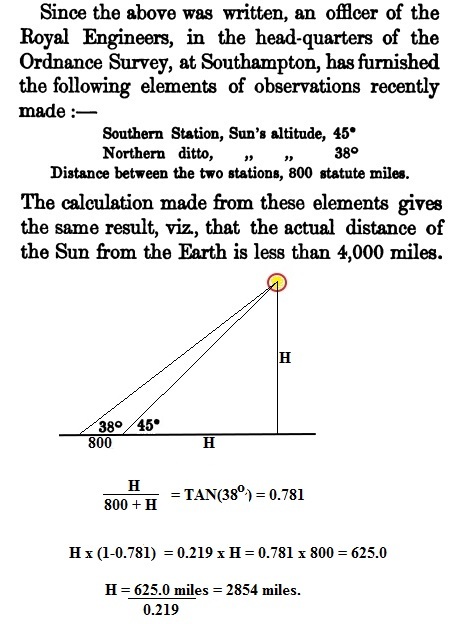 This makes sense in the globe model, where the sun is many millions of miles away, but can also be interpreted as the sun being small and nearby, being at the same distance (3000 miles) from the Equator that the Sun is above the earth (making a 45-degree right triangle). 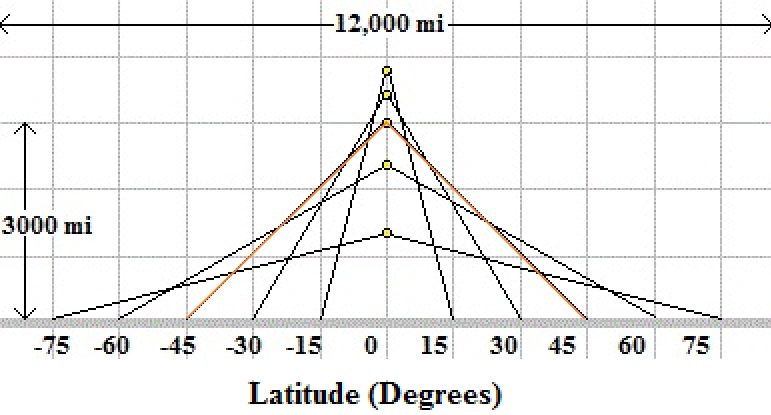 Now, the Voliva method can be applied to any latitude, as shown in the figure below. If the distance from the equator to 45 degrees latitude is 3,000 miles, then the distance from the equator to a given latitude, L, is just 200*L/3. (For L = 45 deg, 200*45/3 = 200*15 = 3,000 miles). In the Voliva model, the diameter of Flat Earth is 24,000 miles. Simple Trigonometry yields the formula for the Height of the Sun, measured on the Equinox, for any given latitude L: H = 200L/(3 tan(L)). The graph below shows heights of the Flat Earth Sun, for various latitudes. These heights are NOT constant, but instead, depend on the observer's latitude. At latitudes closer to the equator than 45o, the sun's apparent height is OVER 3,000 miles; at latitudes closer to the poles, the sun's height is LESS than 3,000 miles. That's a real problem for Flat Earth Theory. If the sun is only a few thousand miles above the Earth, how can that height possibly depend upon an observer's Latitude? All observers should see the sun at the same Height. 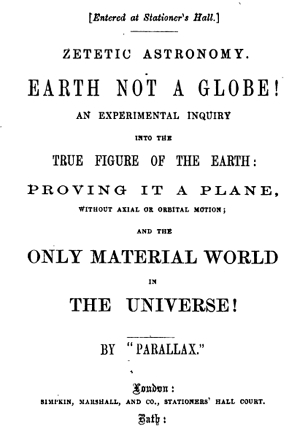 Samuel Birley Rowbotham, an English writer, was the author of "Zetetic Astronomy: Earth Not a Globe" using the pseudonym "Parallax". In section III of his 1865 book, he describes a couple of experiments in which the height of the Sun above the Earth is determined to be "less than 4,000 miles". However, Rowbotham does not actually complete the calculations. Since the maths are straightforward, the results of the actual calculations are provided below. In one of the "Zetetic" analyses, near Southhampton, data are provided on two towns, 800 miles apart. The bottom part of the figure is an addition, with the maths Rowbotham did not complete. Elementary trigonometry can be employed to show that, interpreting the shadows as being on a Flat Earth, the height to the Sun is 2,854 miles. In another "Zetetic" analysis, near Yorkshire, the distance of 151 miles was measured between two locations where the simultaneous elevations of the Sun were 55o13' and 52o2'. 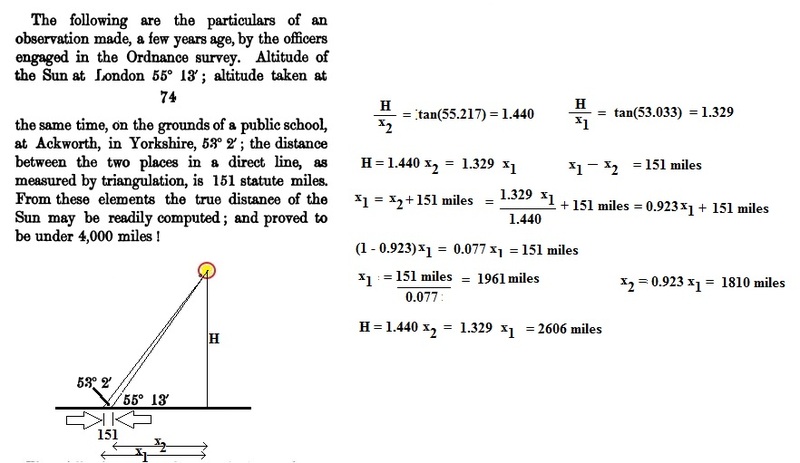 Here, trigonometry and algebra give us the result Rowbotham only hinted at: the Sun is 2,606 miles above the Earth. Globe Earthers are fond of reminding Flat Earthers that the Greek, Eratosthenes, calculated the size of the globe Earth way back in 240 B.C. However, Flat Earthers often respond that Eratosthenes' observations can be interpreted in light of a Flat Earth, and used to calculate the height of the Sun above the Flat Earth. 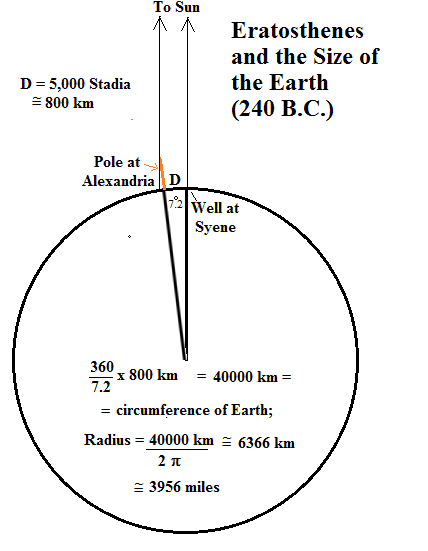 The math is straightforward; using the fact that the shadow of the Sun was 7.2 degrees in Alexandria, but the sun was directly overhead a well in Syene, and that the distance between Alexandria and Syene was 5,000 stadia (~800 km), the height of the Sun above the Flat Earth comes to 6330 km (about 3,940 miles). The Voliva method, which yields a 3,000 mile height of Sun for 45o, gives values of 0 to 3819.7 miles for other latitudes. Two examples from Rowbotham's "Zetetic" book weighed in at 2,854 miles and 2,606 miles. Finally, looking at Eratosthenes' measurements from a Flat Earth outlook yielded a height of 3,940 miles. If the Earth was indeed Flat, should not all observers see the sun at the same Height? The fact that there are so many different heights of the Sun for different FE measurements is itself strong evidence that the Earth is, in fact, a Sphere (or slightly oblate spheroid for the sticklers). All of these examples are onsidered from a Global viewpoint in the next section. 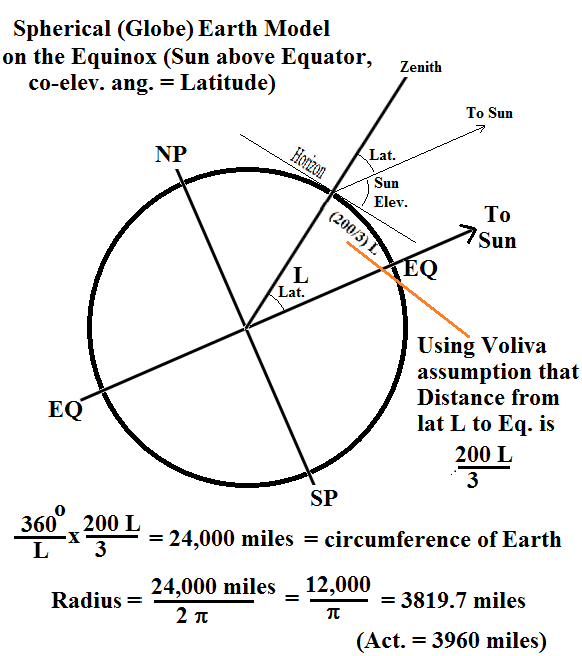 For the diagram for the Voliva model shown above, interpreting the distance from equator to Latitude L as 200L/3 is equivalent to assuming a diameter of Earth of 24,000 miles, a few percent below the accepted value (24,901 miles). 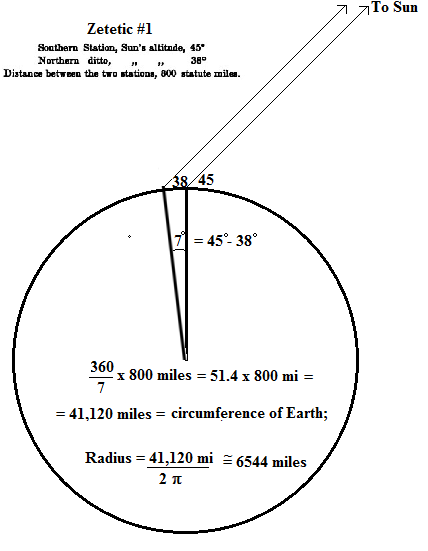 Treating the measurement of sun elevation angle at a given latitude, L, as you would an Eratosthenes-style determination of the earth's circumference, it quickly follows that the radius of the Earth is 12,000 miles /π = 3819.l7 miles, independent of latitude. That is, viewing this experiment in a spherical-based model, the radius of Earth is 12,000 miles/π; but, viewed from a Flat Earth perspective, the height of the sun is anywhere from Zero to 12,000 miles/π. Interpreting the Yorkshire example from a spherical-earth perspective works out a lot better. This Zetetic measurement appears to be more reliable than the preceding one. 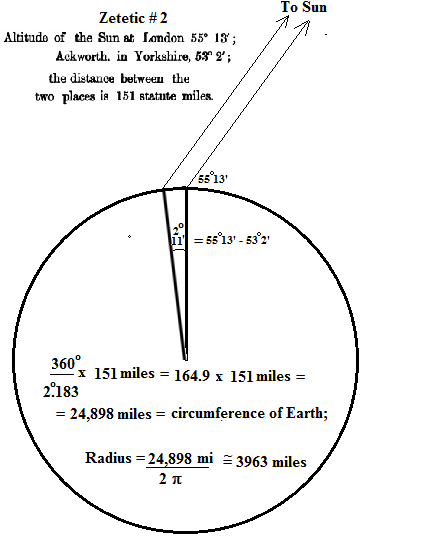 Applying the 151-mile separation to the angular difference of 2o11', the radius of the Earth works out to 3,963 miles, very close to the accepted value. Finally, interpreting Eratosthenes' measurements just as he did in 240 B.C. -- from a spherical earth perspective -- results in a radius of the Earth of 3,956 miles, quite close to the accepted value. Flat Earth Claim that Sun Acts Like a "Spotlight" -- DISPROVED! Simple, Inexpensive Experiment Proves Earth is Round! On the Flat Earth, The Sun Never Sets! December 12th, 2018 NMSR Meeting: Bruce Lacey, on "A Flat Earther's Journey and Perspective"